(AP) A 4-year-old boy is dead after a large tombstone toppled onto him while he and his family were visiting a historic cemetery in a Utah ski resort town. Carson Dean Cheney was at the Glenwood Cemetery in Park City with his family Thursday evening when the 6-foot-tall headstone, which weighed hundreds of pounds, detached from its base and fell onto him, Park City police Capt. Phil Kirk said Friday. Authorities were still investigating how it happened. "This tragic accident has taken the life of our energetic, sweet, beloved little boy," his grandmother Geri Gibbs said in a statement. Kirk said an investigator was at the cemetery Friday morning probing the incident. He said family members were able to free the boy from under the fallen tombstone before emergency crews arrived, and paramedics tried to save him at the scene. The child had injuries to his head, chest and abdomen and was taken to the nearby Park City Medical Center, where he died. "We're dealing now with not only the family, but also the emergency responders who are all saddened by what happened," Kirk said. 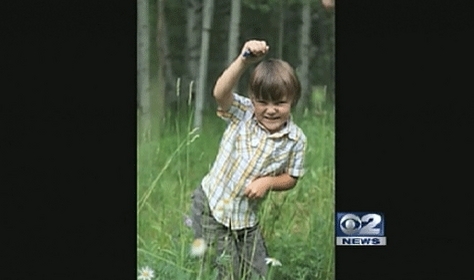 He said the boy and his family were visiting from Lehi, about an hour away. It wasn't immediately clear why they were at the cemetery or if they had relatives buried there. Bruce Erickson, president of the Glenwood Cemetery Association, said the private, five-acre cemetery around the corner from Park City Mountain Resort was founded by a society of silver miners in 1885. It is open to the public and still accepts burials of people connected to the mining society. Erickson said no funerals were held at the cemetery Thursday. New burials happen maybe just once a year, he said, and families are responsible for maintaining the headstones, many of which are at least 100 years old. Erickson said the cemetery likely will be closed through the weekend.